But here is hopefully a little inspiration for the grill. Succulent, tender, creamy, tangy yoghurt marinated chicken. Hot and sweet chili scampi. Rich and sweet BBQ pork. Crunchy, sweet vegetables…Go get fired up! I just bought myself a wonderful gas grill. I know, gas will never be as good as coal or wood fired and so on… But at least I use it! A lot! At least if you factor in the Stavanger-weather this summer (utterly preposterous! )… And you can always use wood chips and smoke the meat in a gas grill as well. I´m sold; I´m pushing the gas. Can ya tell? I had some really good friends all the way from Alabama visiting a little while back. We grilled some lovely skewers (outside) and ate some lovely skewers (inside). Even though the meat needs to marinate a little while (preferrably overnight for the chicken, and at least a couple of hours for the pork and the scampi), the actual work involved is not much. Cube the meat in as even pieces as you can to ensure even cooking. 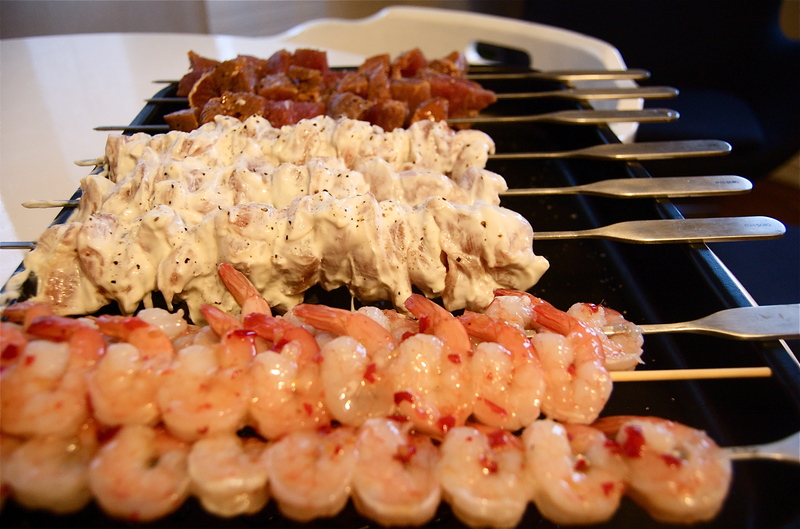 By having “mono-themed” skewers it is also easier to avoid under-/over cooking. 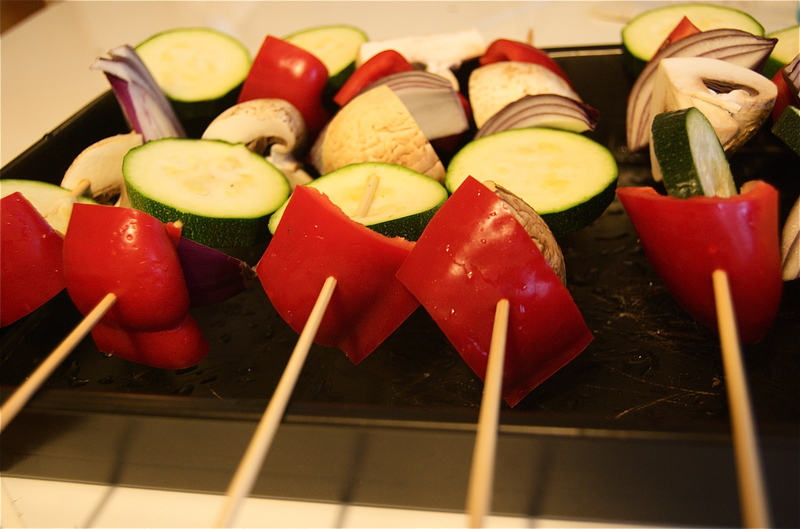 Cut and skewer the vegetables (leave the tomatoes whole) and brush with olive oil. Then season with salt and pepper. Start by grilling the chicken and the pork. When they are almost done, put the vegetables on. And at last, put the scampi on. They seriously don´t need long on the grill!